If you ever want to make a cook’s day, request a favorite dish of his or hers. Speaking from experience, we’re so thrilled that we’ve had a “hit” we’ll gladly oblige! As a result of those “experiments,” the one thing I’ve had more requests for really isn’t a “dish” – it’s a sandwich. And a mini-sandwich at that. 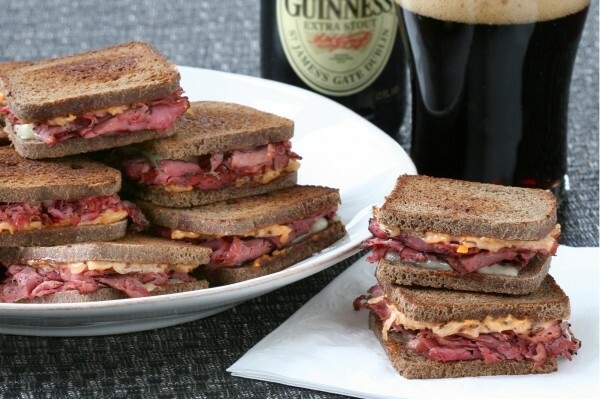 These Mini-Reuben Sandwiches are pretty much the perfect party food. You can make them well in advance, they’re easy to eat, and they’re “guy friendly.” And I don’t just make them for parties. For all the reasons above, if you stop by during football season, it’s a safe bet I’ll have some of these on hand.